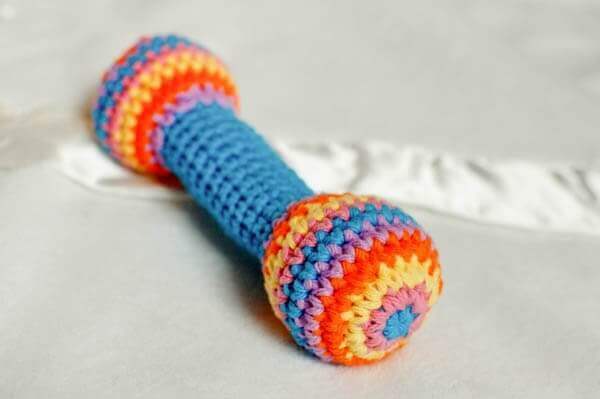 This crochet baby rattle is as easy to make as it is cute! It is the perfect size for little hands to clutch and shake. Crochet one up for your own little one or to give as a gift. Size: Finished toy measures approx. 7½ in. 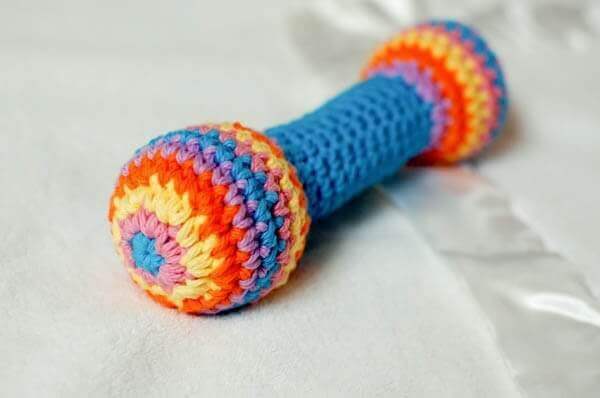 Please note that as with all handmade toys and baby items, this crochet baby rattle should be checked regularly for pulls or unraveling stitches that may allow stuffing to come out and become a choking hazard. As always, infants and small children should be supervised. For best results, use an invisible decrease for sc2tog (see Planet June for a tutorial). Change colors with every round unless otherwise noted. Note that the color used in the foundation round will be the color of the center grip. With CA, make a magic ring (as an alternative to the magic ring, you can ch 2 and work the stitches for Round 1 in the 2nd chain from hook). Round 1 (CA): Ch 1 (does not count as st here and throughout), work 6 sc in ring, join — 6 sts. Round 2 (CB): Ch 1, 2 sc in same st as join and in each st around, join — 12 sts. Round 3 (CC): Ch 1, 2 sc in same st as join, 1 sc in next, *2 sc in next, 1 sc in next, rep from * around, join — 18 sts. Round 4 (CD): Ch 1, 2 sc in same st as join, 1 sc in each of the next 2 sts, *2 sc in next, 1 sc in each of the next 2 sts, rep from * around, join — 24 sts. Rounds 5 through 8 (CE, CA, CB, CC): Ch 1, 1 sc in same st as join and in each st around, join — 24 sts. Round 9 (CD): Ch 1, beginning in same st as join, sc2tog, 1 sc in each of the next 2 sts, *sc2tog, 1 sc in each of the next 2 sts, rep from * around, join — 18 sts. Round 10 (CE): Ch 1, beginning in same st as join, sc2tog, 1 sc in next st, *sc2tog, 1 sc in next st, rep from * around, join — 12 sts. Rounds 11 through 21 (CA): Use same color for all rounds. Ch 1, 1 sc in same st as join and in each st around, join — 12 sts. Round 22 (CE): Reverse color sequence. Ch 1, 1 sc in same st as join and in each st around, join — 12 sts. Round 23 (CD): Ch 1, 2 sc in same st as join, 1 sc in next, *2 sc in next, 1 sc in next, rep from * around, join — 18 sts. Round 24 (CC): Ch 1, 2 sc in same st as join, 1 sc in each of the next 2 sts, *2 sc in next, 1 sc in each of the next 2 sts, rep from * around, join — 24 sts. Rounds 25 through 28 (CB, CA, CE, CD): Ch 1, 1 sc in same st as join and in each st around, join — 24 sts. Round 29 (CC): Ch 1, beginning in same st as join, sc2tog, 1 sc in each of the next 2 sts, *sc2tog, 1 sc in each of the next 2 sts, rep from * around, join — 18 sts. Round 30 (CB): Ch 1, beginning in same st as join, sc2tog, 1 sc in next st, *sc2tog, 1 sc in next st, rep from * around, join — 12 sts. Round 31 (CA): Ch 1, beginning in same st as join, sc2tog around, join — 6 sts. Fasten off. Using last color, weave around stitches and pull gently to close opening. Weave in end, ensuring that it is secure. Click here for more crochet baby patterns. 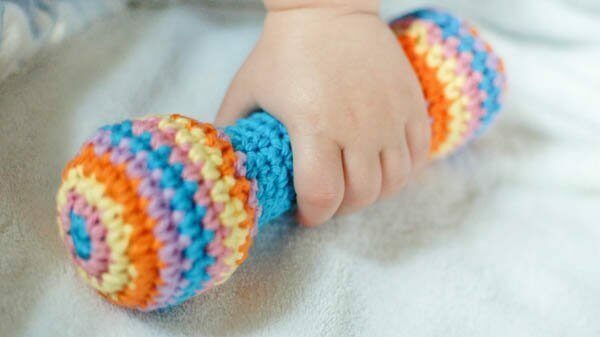 I really love both your rattle and teether patterns; wish I would have had these when I was having my babies! A very good friend that just had a new baby, and I will definitely l have to give these a try! This will be an excellent handmade and easily customizable baby gift. Thanks for sharing!